Due to several securities vulnerabilities these days, it is truly significant for each one of us to ensure that your Android data is kept secure. 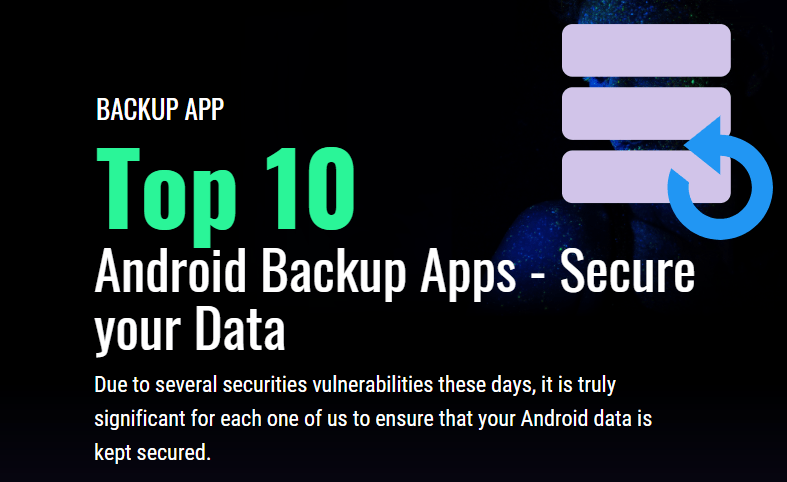 However, there are several excellent Android backup apps that are particularly meant to safeguard your device from losing all sorts of data. Here I am going to list the top 10 Android backup apps, some out of user reviews, rates of download while the rest are out of my personal experience. It provides a simpler User Interface that helps you back up stuff such as SMS, MMS, apps, system settings, call logs, contacts, etc. However, some controversies regarding occasional bug have been reported. This application comes with a simple GUI that is easy to access for any user. It makes sure that you do not lose even a single slice of your data. Be it apps, contacts, messages, images or videos, it will restore all your files perfectly. This backup application comes with a lot of features and updates. It helps you to backup apps, freeze and uninstall bloatware, etc. There are more options available in the Pro version of this application. It is a wonderful application for every root user. It is one of the best apps for non-root users, yet there is a root support available along with for those who need it. It also helps you sync apps among Android devices, thereby assisting in the process of backing up and restoring the data from cloud storage. It is the best app for root users. You can manage Nandroid backups using this app which users OpenRecoveryScript to perform the reboot. It supports 8000+ Android devices and is a perfect backup application with the assurance that there is no data loss during restore, backup or export. You can backup videos, images, apps, SMS, contacts and everything with this app. This app lets the users to backup images, videos, apps, music, SMS, call logs and system settings. There is a free version available to it through which you can backup your external SD card. On the contrary, with the Pro version, there are more options available. This is an extremely powerful app that is known for offering quick and reliable service to the users without any issue. It ensures the availability of work services with the authentic Google Cloud Storage as well as lets you to open your files on Google platforms like Google Photos or Google Docs. It creates a list of all your applications in plain text, XML, Markdown, market URLs, BBCode as well as help you to create the list using a template of your choice. It works pretty well for users who are contented with a short list of apps or do not want to use the cloud storage. It is one of the amazing backup apps that enable you to restore APKs, contacts, system stats and a lot more. It sets an auto-backup with the provision of backing up to the SD card or Cloud. After you have made a factory reset, this app enables you to re-install the stored APKs whenever you would need it. Now that you know the best Android backup apps, give a try and let us know which one worked perfectly for you!